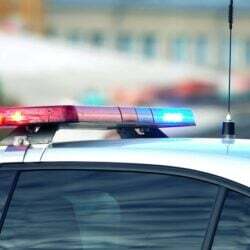 SACO — Perian Carpenter was a child when she stood in Camp Ellis with her family and watched as a house her father had worked on was swept out to sea. “We were helpless to do anything,” she said. 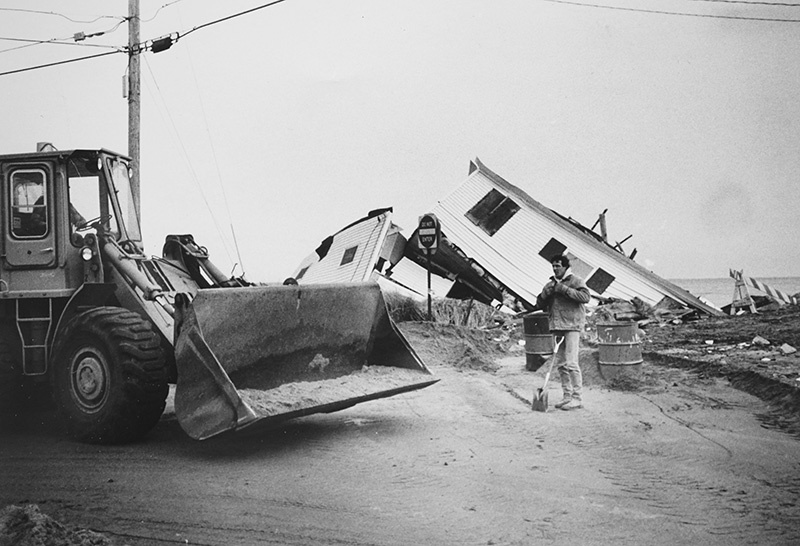 More than 40 years later, many people in Saco say they still feel helpless as they watch powerful storms and high tides carve away the shore of what was once a vibrant fishing village. 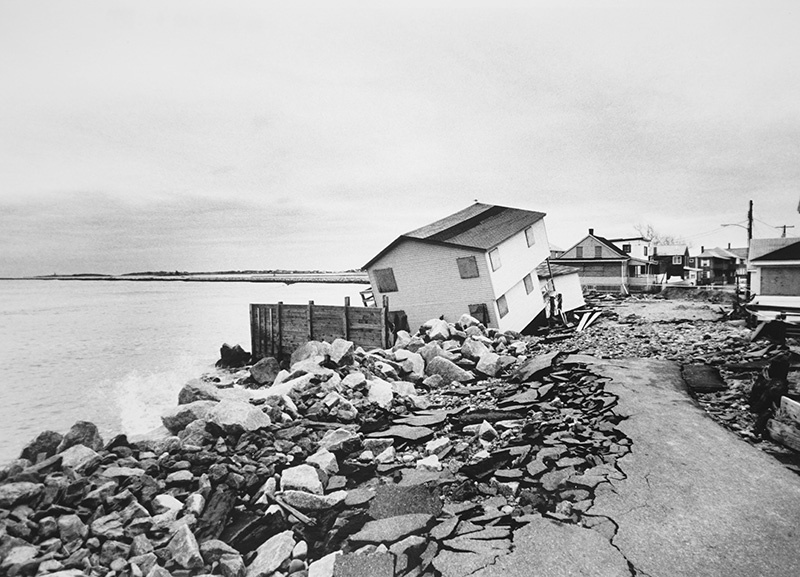 Thirty-eight homes have been destroyed in the past 50 years, roads have washed away and the beach is disappearing at a rate of several feet per year. City officials say they struggled for decades to get recognition from the Army Corps of Engineers that a jetty it built in the 1890s is to blame for much of the erosion in Camp Ellis, and they remain frustrated that the federal government has not started work to protect the shoreline. Now, after years with no movement, the Army Corps is again looking at how to shore up Camp Ellis using $26.9 million authorized 11 years ago by Congress but never appropriated. 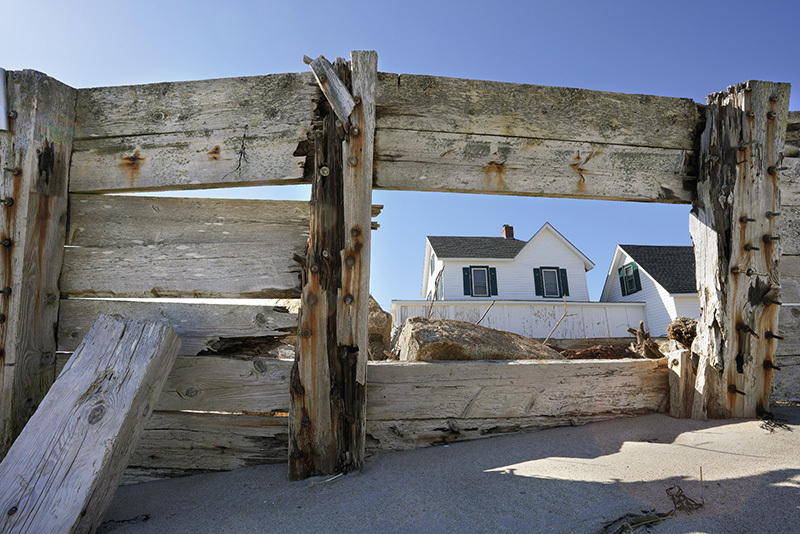 In early March, a nor’easter pounded the Maine coast for six straight days, causing at least $2.75 million in damage to public property and the most significant beach erosion in York County in more than a decade. Saco officials estimate at least $650,000 in damage. The storm caused as much damage to public infrastructure in Camp Ellis as the Patriot’s Day Storm of 2007, a historic storm that caused $54 million in damage statewide. 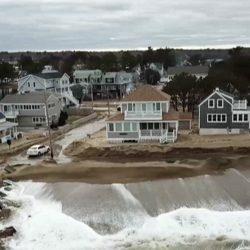 A drone photo shows North and Main streets in Camp Ellis, shortly after a weeklong nor’easter last month pounded the area with a series of high tides that exceeded flood level. The 10 consecutive high tides between March 2 and 8 that exceeded flood levels washed out roads, pushed tons of sand off the beach and damaged more than a dozen homes. 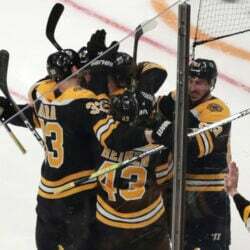 Some 200 feet of geotubes – huge sandbags buried in the beach to protect the shoreline after a road in that spot was washed away in 2007 – were completely torn apart during the storm, said Patrick Fox, director of public works for the city. A month later, roads are still blocked off as the city repairs the damage. 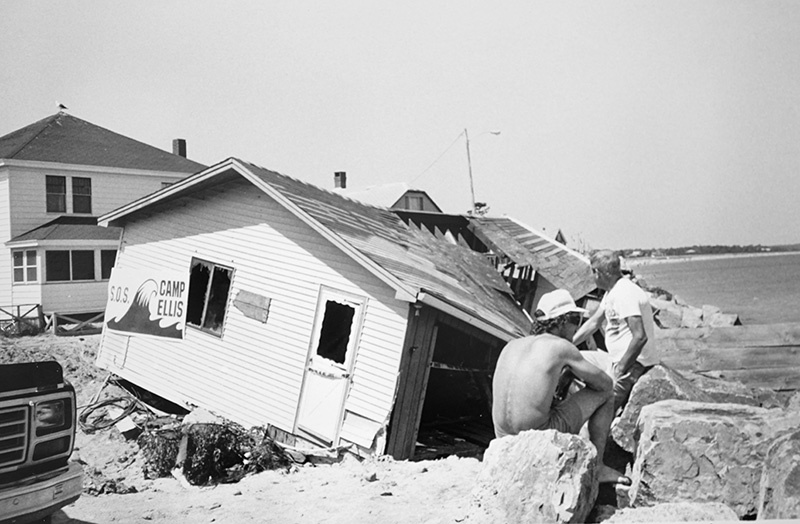 Camp Ellis isn’t the only coastal Maine community fighting the effects of coastal erosion. Rising sea levels attributed to climate change have magnified the effects of storm surges, a trend expected to accelerate in years to come. 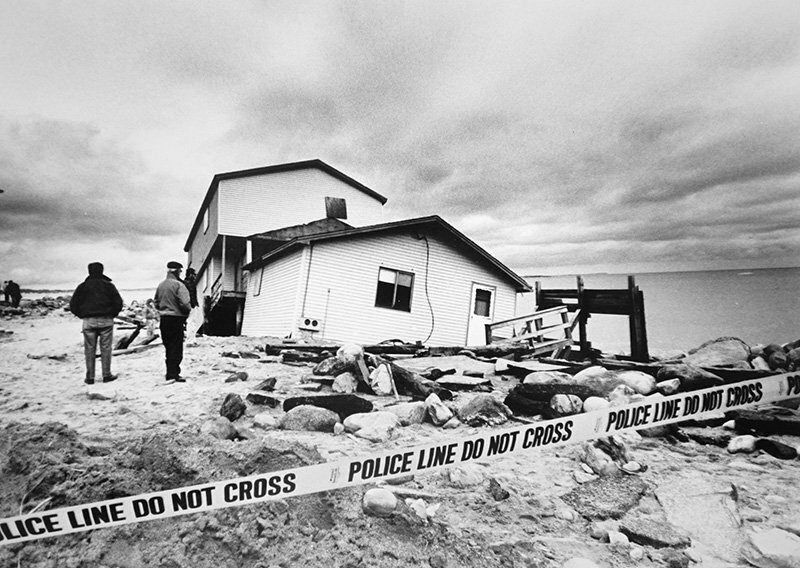 In Maine, sea levels have risen about eight-tenths of a foot over the past century. The long-term forecasts have fueled arguments that coastal communities should retreat rather than continuing to armor the coastline and rebuild roads and buildings that will only be washed away as the sea continues to rise. Camp Ellis’ struggles have been more dramatic, however, and the 128-year-old jetty gets much of the blame. After 15 years of study and 35 proposals, the Army Corps of Engineers in 2013 recommended a shore damage mitigation project that includes building a 750-foot spur jetty extending from the existing jetty and the placement of about 365,000 cubic yards of sand along the beach north of the jetty. 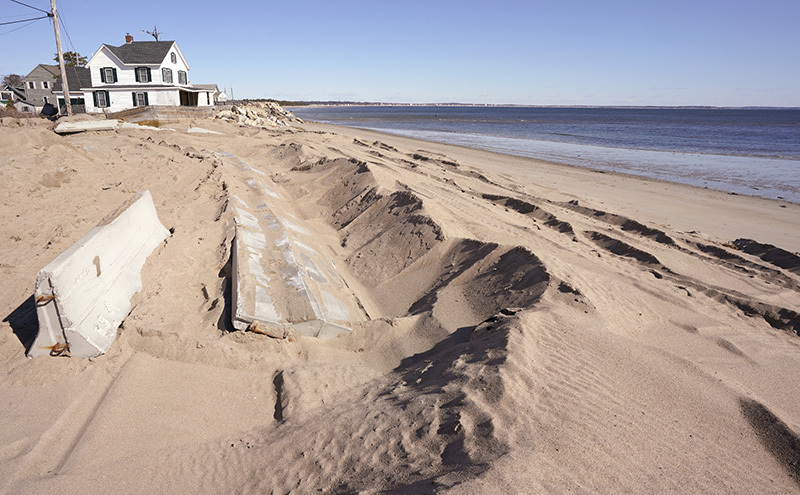 The beach would require renourishment of about 116,000 cubic yards of sand every 12 years. The spur jetty is designed to break up the destructive wave action that scours sand from Camp Ellis, but scientists say it will likely only slow the problem instead of fixing it entirely. 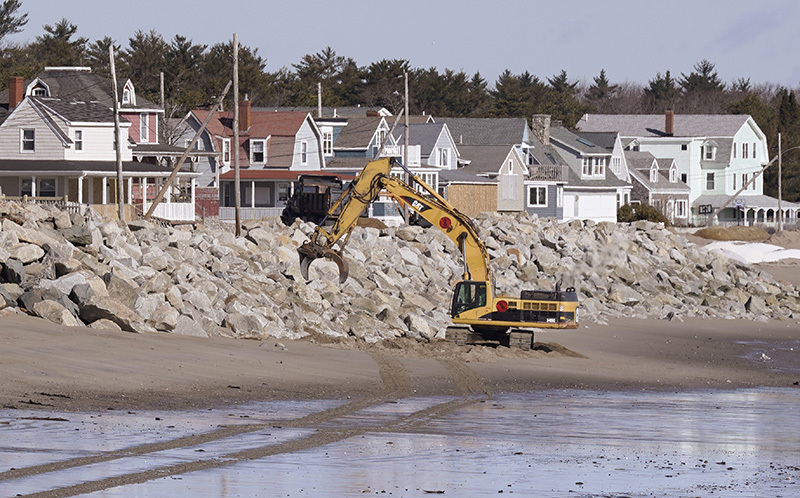 The Army Corps estimated that work, not including the subsequent beach renourishment, would cost $26.9 million, but now says it would cost about $31 million. The cost of future renourishment is currently estimated at $48 million. City officials were notified recently that the Army Corps is now preparing a final report on a proposal to scale back the proposed beach-fill component to reduce the project cost to the $26.9 million authorized limit. 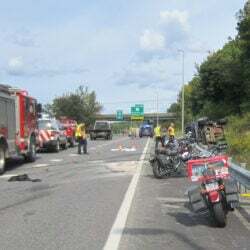 That report is due May 15, but there is no estimate of how long it will take Army Corps headquarters to review the report or release final details, according to study manager Mark Habel of the Army Corps of Engineers New England District. City officials will hold a meeting at 6 p.m. May 23 at City Hall to update residents on the Army Corps report. Saco officials and Camp Ellis residents say the work is a long time coming, but still question how much more damage will be done while they wait for the Army Corps to start the project. 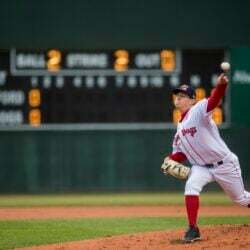 In the early 1800s, Saco and Biddeford were big textile ports, with large ships coming in carrying coal and leaving loaded with textiles churned out in the mills built on the banks of the Saco River. Unpredictable sandbars and a gigantic ebb shoal made it difficult for ships to navigate the river without running aground. 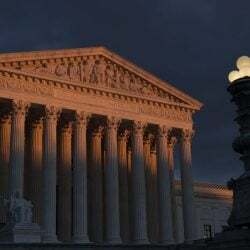 To deal with the issue, Congress in the mid-1800s passed a law that allowed the Army Corps of Engineers to stabilize the Saco River, said Peter Slovinsky, a marine geologist with the Maine Geological Survey. 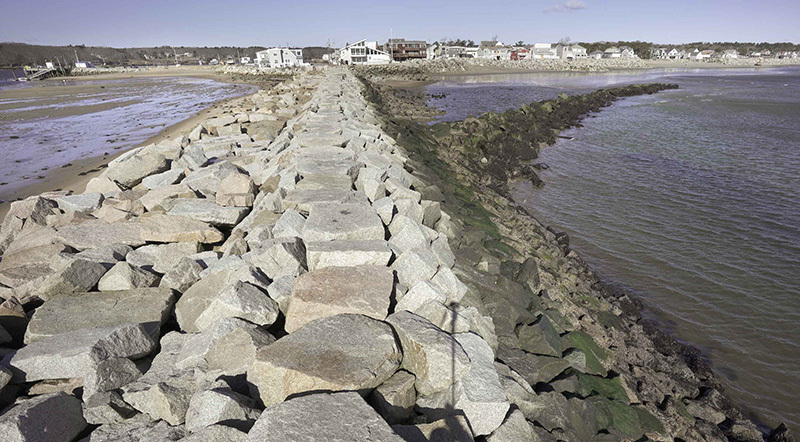 The solution was the construction of the north jetty, which extends 6,660 feet from the shore to keep the harbor open at the mouth of the river. After the jetty was completed in 1890, the channel was dredged to allow commercial ships to easily navigate the river. 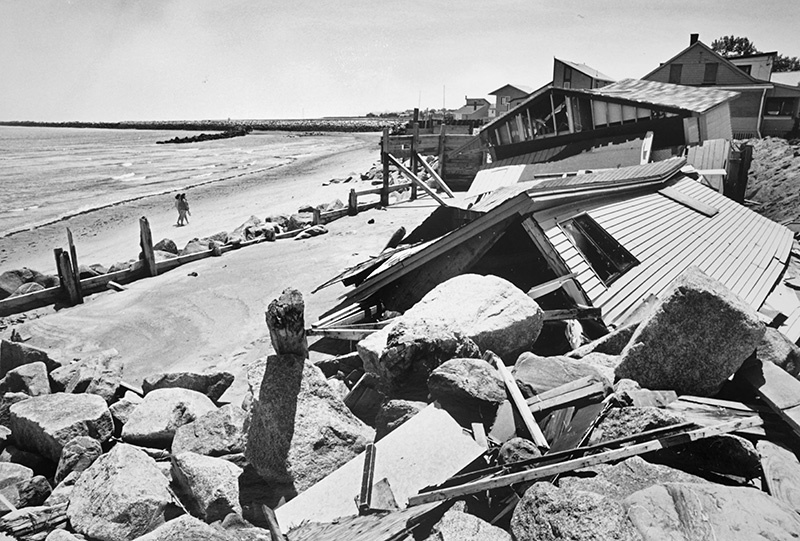 The work allowed ships better access to the river, but the jetty altered the way sand moved from the river to the beach and the way waves hit the coast, causing erosion that has swept away at least three dozen houses in the past 100 years. The sand movement is controlled by opposing wave and river forces. 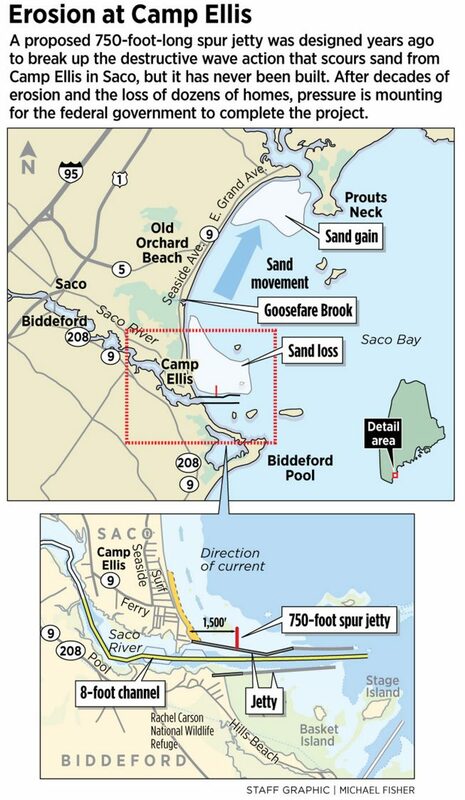 Most of the sand that originally built and sustained the beach at Camp Ellis came down the Saco River, but the jetty now drives that sand supply farther out to sea and very little of it makes its way back to naturally rebuild the beach. Without this supply, the incessant south-to-north movement of sand robs the Camp Ellis beach and adds it to beaches to the north, Slovinsky said. Slovinsky said storms drive waves along the jetty in a drilling effect, scouring sand out of the area. 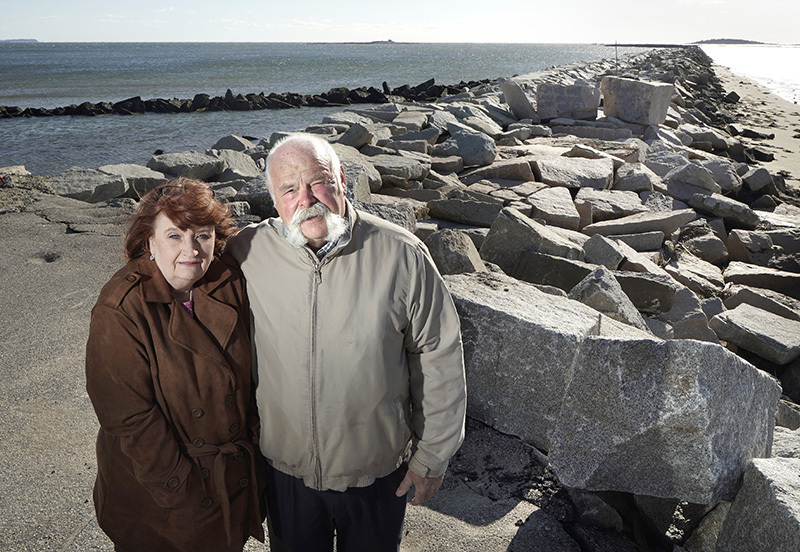 The city has spent more than $2.5 million over the past 10 years – an average of nearly $300,000 per year – on coastal erosion repair and mitigation efforts. Only $780,000 of those repairs was associated with FEMA-declared disasters. Saco also has lost millions of dollars in taxable oceanfront property, though officials don’t have an official total. Patrick Fox, the city’s public works director, said his crews deal with closed or damaged roadways eight to 10 times a year and are used to dealing with flooding in Camp Ellis whenever there are storms or especially high tides. He calls it a “Band-Aid approach” until the major project comes to fruition. The Camp Ellis issue has taken a permanent spot on City Administrator Kevin Sutherland’s desk since he started his job with the city more than two years ago. During the storm in early March, he went to Camp Ellis for 10 consecutive high tides and watched as crews tried to minimize the damage from sand, rocks and water. 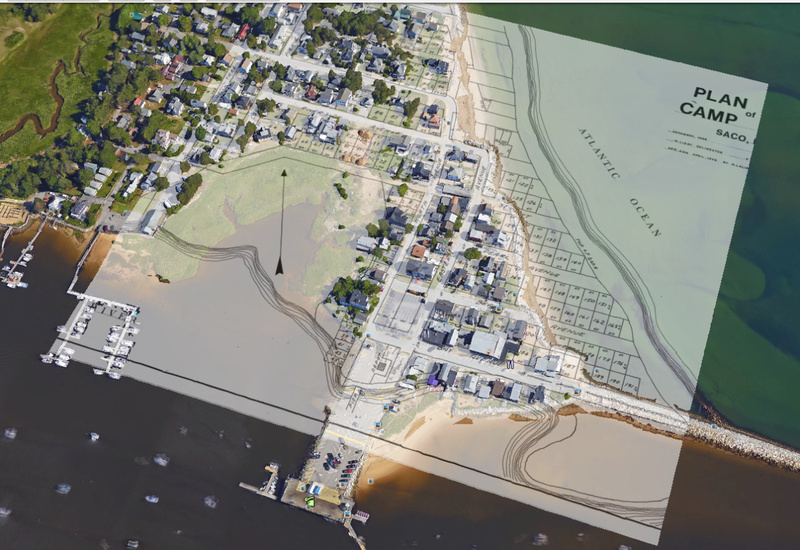 Saco city officials created this image using a map from 1908 and a current image of Camp Ellis to illustrate how the coastline has changed over the past century and the number of houses and roads that have been lost to the sea. 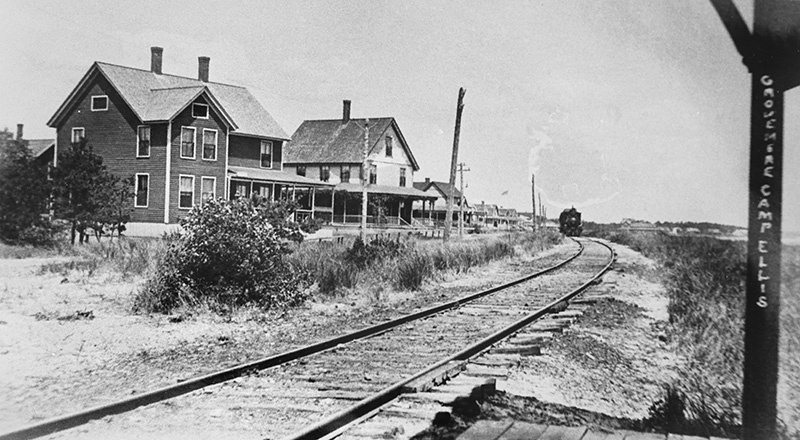 The photo is a 1916 photo from the Maine Sunday Telegram archives showing a train moving along the coast of Camp Ellis. The railroad tracks were located on land that is now under water. Last year, Sutherland approached the council with three options: push for funding for the project, sue the Army Corps to force the work to start, or ask the government to buy properties in Camp Ellis and make the area into a park. There wasn’t much interest in the second two options, so city officials continued to push for the Army Corps work to begin. Kevin Roche, a former city councilor and member of the Shoreline Commission, describes the renewed focus on a Camp Ellis solution as a “full-court press on the congressional delegation and Army Corps.” When he was on the council, the board voted to pay for an attorney in Washington, D.C., to lobby on behalf of the city for the federal government to start the project. “Saco is really out of options. We’ve done everything we can do as a municipality,” he said. Chenette, the Democratic state senator, submitted with Rep. Donna Bailey of Saco a resolution requesting the federal government to fund the Camp Ellis project. Mayor Lovell formed the Saco Bay Working Group this year to focus on Camp Ellis issues and the impact on the rest of the city. The group includes city staff and elected officials, members of the Shoreline Commission and scientists from the University of New England. The group hopes to meet with the Army Corps and the congressional delegation by May. News that the Army Corps is working on another report was welcomed by members of the Shoreline Commission, but they know nothing will happen quickly. Even with news that the project could move forward, there is frustration in Camp Ellis. Residents have been told repeatedly over the years that mitigation work would be done, only to see progress halt over funding concerns or issues with endangered piping plovers. Perian Carpenter, whose family has lived in Camp Ellis for three generations, and her husband, Rod Carpenter, have heard it all before. They’ve watched as the beach where they went to bonfires as teenagers disappeared and the summer cottages owned by friends were destroyed by the ocean. 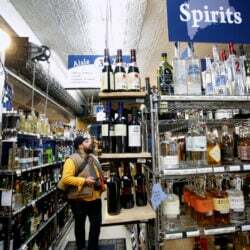 They’ve seen seasonal businesses close and a shift toward more seasonal residents in Camp Ellis. Fairhaven Avenue in Camp Ellis. Rick Milliard lives in Camp Ellis and has served on the Shoreline Commission for years. 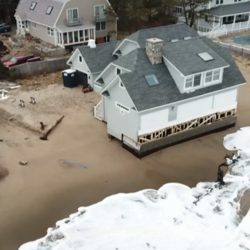 A cottage his father built washed out to sea in 1957 and he now lives four houses away from the water. 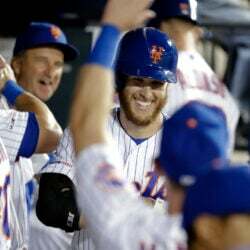 He said he is encouraged by the “tremendous amount of progress” that has been made recently.